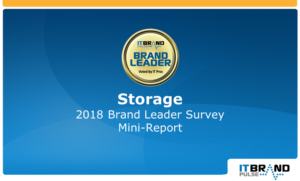 SAN DIEGO, CA—March 14, 2018—IT Brand Pulse, a trusted source for research, data and analysis about data center infrastructure, today announced the results of the recent IT brand leader survey covering Storage products. 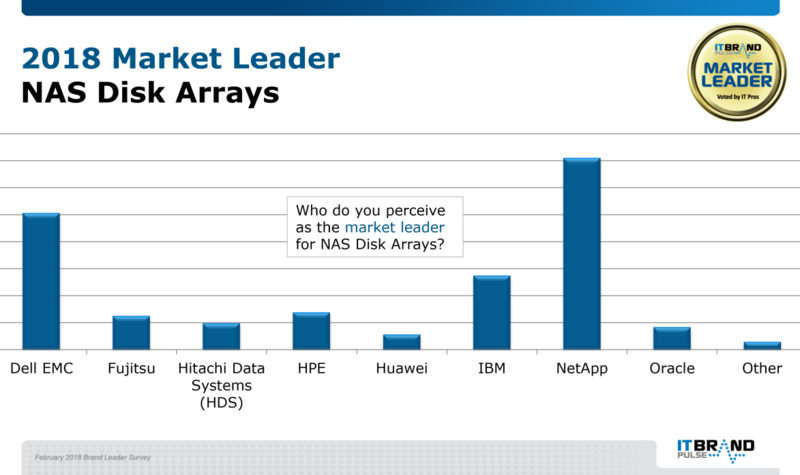 For the eighth year in a row, NetApp captured Market Leader for NAS Disk Arrays. 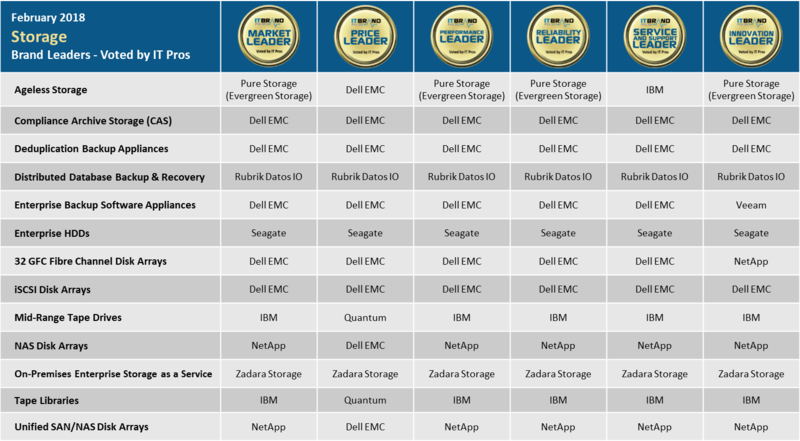 In addition, NetApp picked up Performance, Reliability, Service & Support, and Innovation –leaving Price to Dell EMC, the all-around runner-up. IBM ended up with third-place Market Leader. 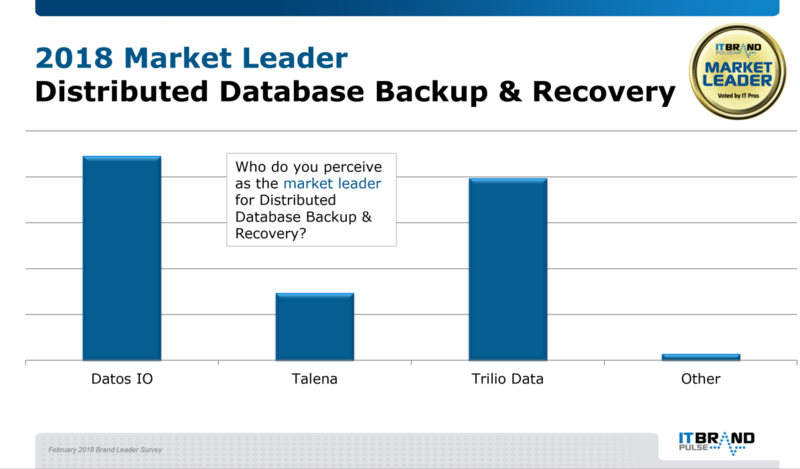 NetApp was named Market Leader (fifth straight time), and pulled in Performance, Reliability, Service & Support, and Innovation. Dell EMC nabbed Price Leader and stayed in front of IBM for number two in the Market category. 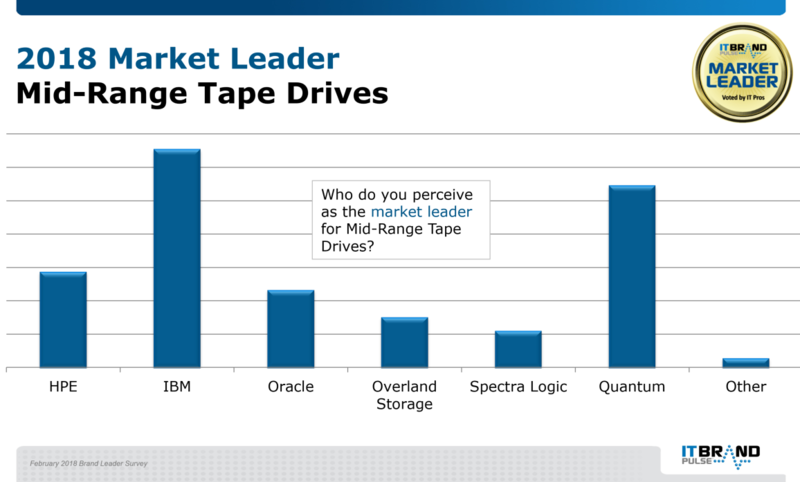 Breaking up the six-year Market Leader lock on Mid-Range Tape Drives, IBM pushed past perennial champion Quantum to become this year’s 2018 Market, Performance, Reliability, Service & Support, and Innovation leader. Quantum held on to Price and kept HPE to an overall third. 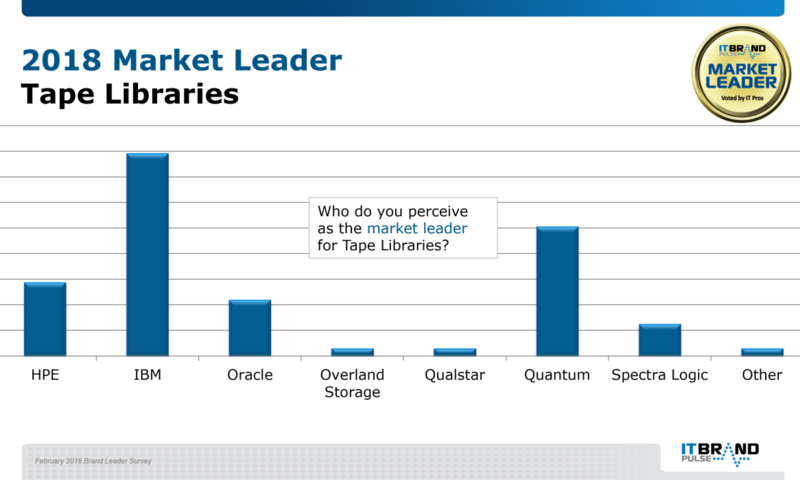 As in the Mid-Range Tape category, IBM was the IT professionals’ 2018 choice to replace Quantum’s Market Leader hold on Tape Libraries. In addition, IBM collected Performance, Reliability, Service & Support, and Innovation honors. 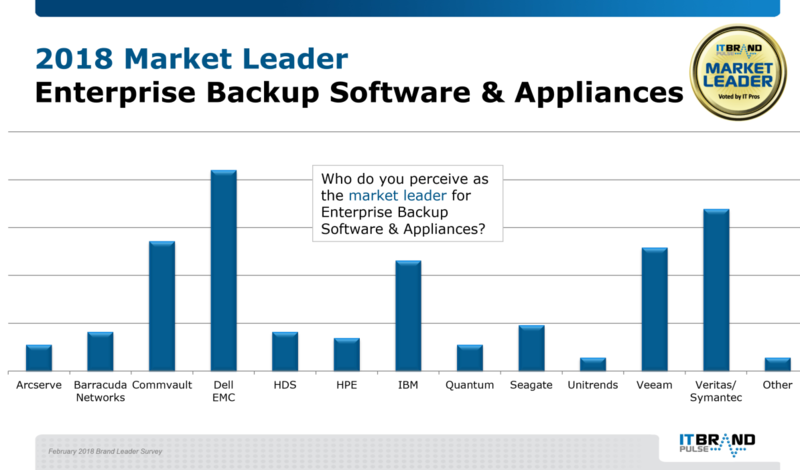 Quantum remained Price Leader and placed second across the board, followed by HPE. 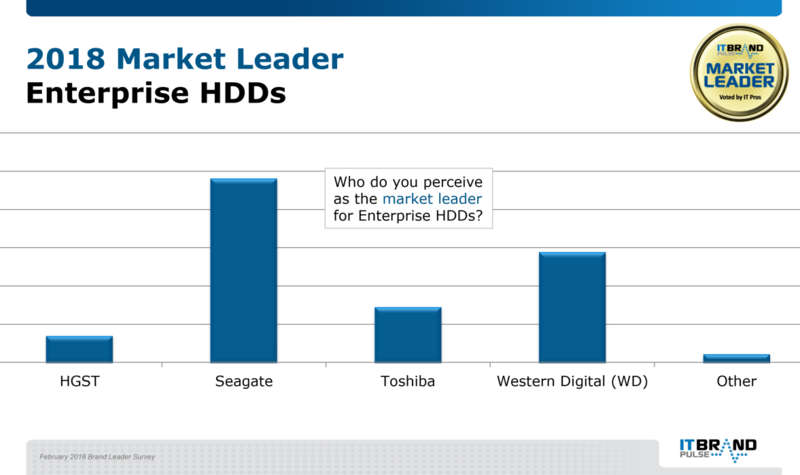 Garnering nearly half of the votes, Seagate outperformed second-place challenger, Western Digital, to acquire its sixth Market Leader award for Enterprise HDDs. In addition, Seagate accomplished a clean sweep by winning all Enterprise HDD leadership categories; taking back the Price seat from 2017 champ, Western Digital. Toshiba was the third Market Leader. “Seagate is honored to be recognized by IT Brand Pulse for the 6th year in a row as the top Enterprise HDD leader from this prestigious group of Data Center Professionals. At Seagate, we take pride in building precision-engineered solutions that deliver trusted performance, solid reliability and ironclad enterprise security to meet the unprecedented growth and efficiency needs of cloud data storage centers worldwide”, said Sharmistha Mallik, Product Marketing Manager at Seagate Technology. 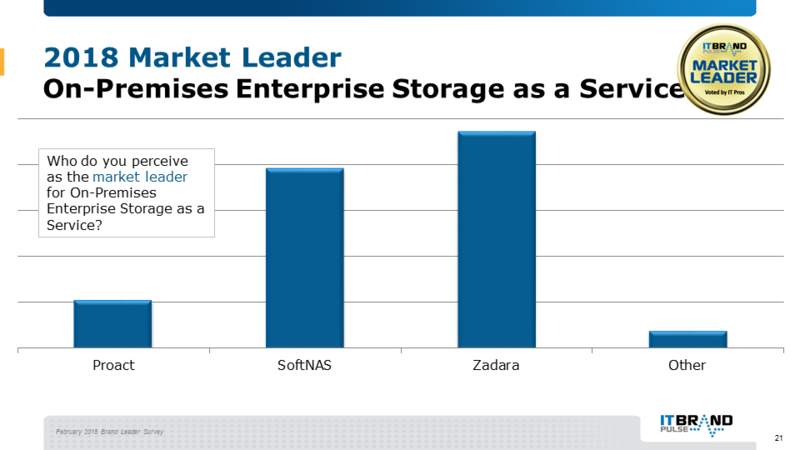 Zadara Storage showed that it is still the company to beat for On-Premises Enterprise Storage as a Service, with this year making it a three-peat Market Leader distinction. Zadara also took home awards in the remaining categories—Price, Performance, Reliability, Service & Support, and Innovation. SoftNAS was the runner-up for all leadership, ahead of Proact Storage. Dell EMC once again held back the competition, claiming iSCSI Market Leader for the eighth year in a row, as well as all remaining awards (Price, Performance, Reliability, Service & Support, and Innovation). 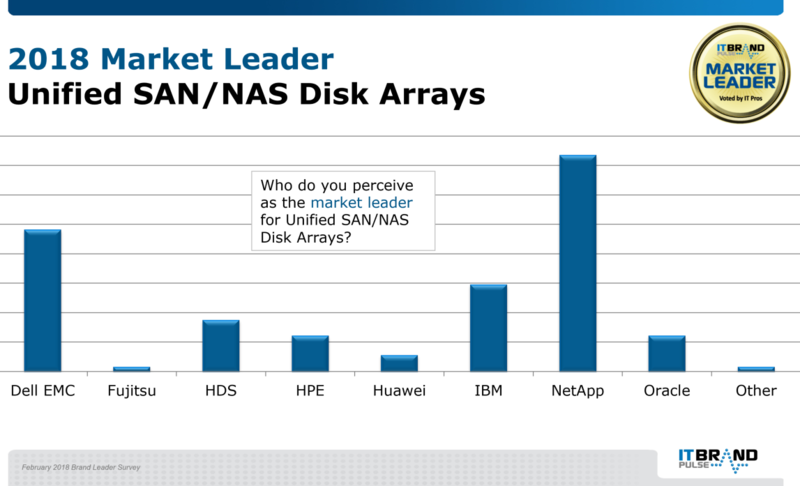 NetApp repeated its spot as Market Leader runner-up for the second year in a row, with IBM next in line. 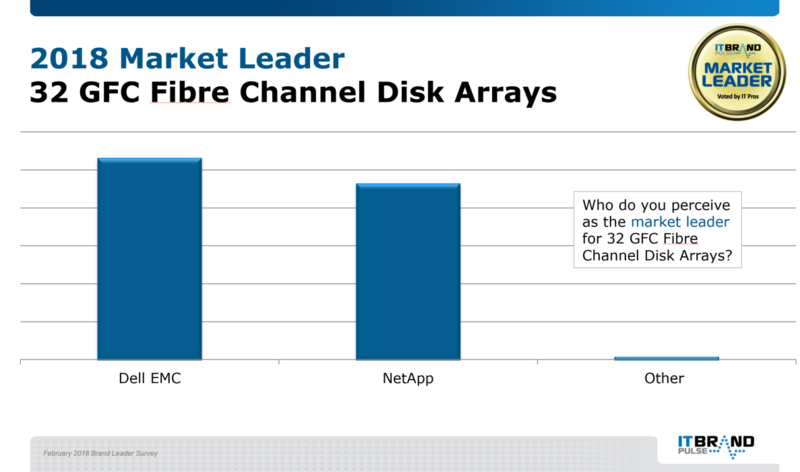 Proving its powerhouse status in Fibre Channel Disk Arrays, Dell EMC brought home its eighth straight victory as Market Leader (although it is the first in this more specific 32GFC category). IT Pros also chose Dell EMC for Price, Performance, Reliability, and Service & Support, while NetApp (second-place Market Leader) prevented a sweep by earning the Innovation honor. 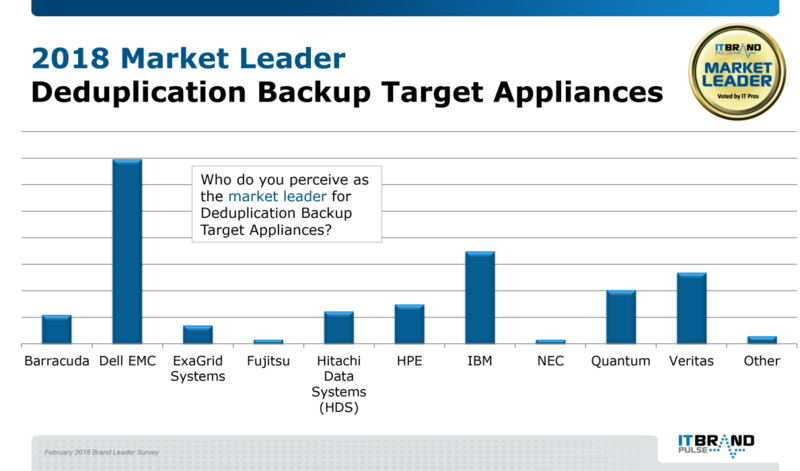 Dell EMC continued its dominance in Deduplication Backup Target Appliances by collecting all six leader titles—Market, Price, Performance, Reliability, Service & Support, Innovation (the fourth time in as many surveys). IBM took the number two Market post, ahead of Veritas. Dell EMC unseated the reigning Market Leader, Veritas (which came in second), for Enterprise Backup Software Appliance and went on to win Price, Performance, Reliability, and Service & Support leader. Veeam interrupted the run on this product category by repeating Innovation Leader. 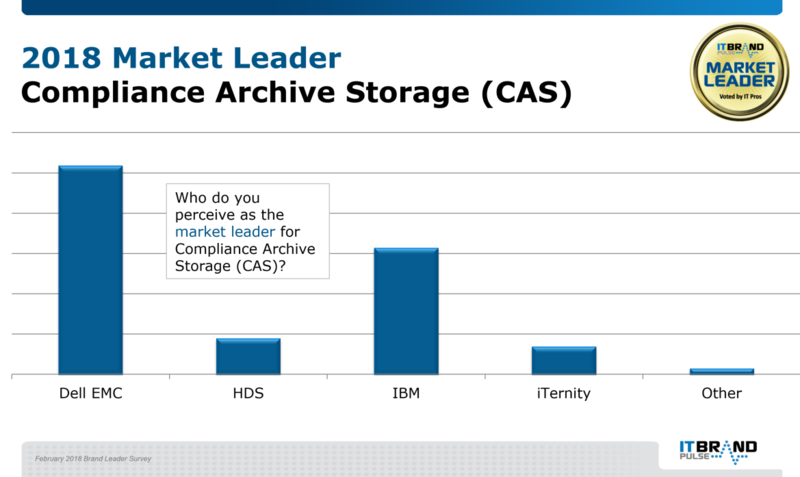 With the debut of Compliance Archive Storage as a brand leader survey category, Dell EMC was voted by end users as Market, Price, Performance, Reliability, Service & Support, and Innovation leader. 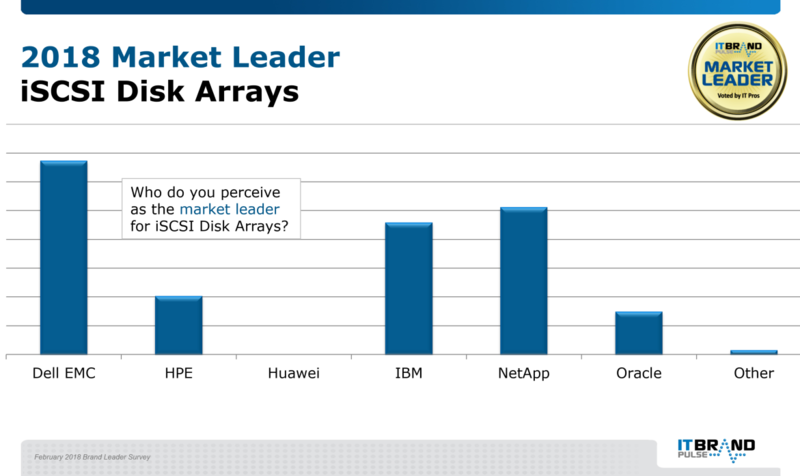 IBM bested HDS to round out the number two and three Market achievements, respectively. In the second IT Brand Pulse survey for this product category, Rubrik Datos IO again came out on top for the leader sweep (Market, Price, Performance, Reliability, Service & Support, and Innovation). Trilio Data and Talena (now Imanis Data) finished two and three Market Leader, in that order. 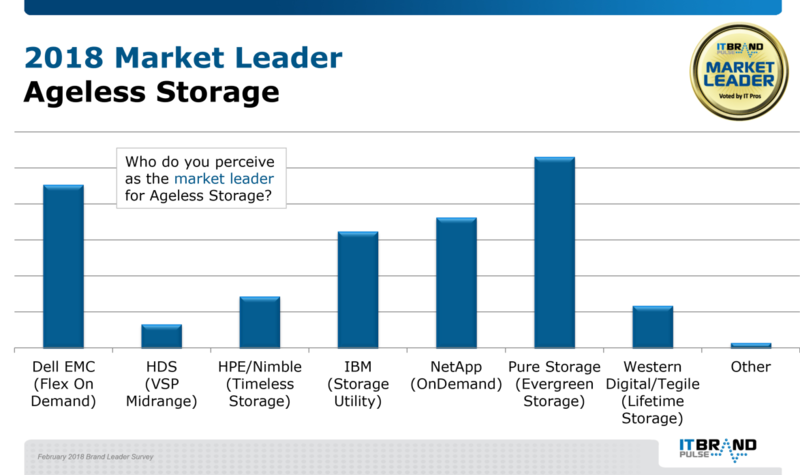 In the first IT Brand Pulse survey conducted for Ageless Storage, Pure Storage emerged as Market, Performance, Reliability, and Innovation leader. Dell EMC was selected for the Price title (and number two Market, in front of IBM). Service & Support Leader went to IBM. IT Brand Pulse awards are the symbols for brand leadership. Winners are voted by global IT pros in surveys that are independent, non-sponsored research. The surveys are designed to measure the pulse of brand leadership in specific product categories. Within each product category, respondents choose the overall market leader, as well as the leader in price, performance, reliability, service and support, and innovation. Voters are provided with a category description at the start of each product section, a randomized choice of vendor answers, and the ability to write in a vendor, if not listed. Global IT Pro respondents to recent surveys include: Adobe – Alliant Energy – Allergan – American Financial Group – Barclays – Beckman Coulter – Bentley Systems – Big Lots Stores – Bloomberg – Boeing – Boral – BorgWarner – Bosch – Boston Scientific – Brigham Young University – Brinker International – British Airways – Capital Group – CBRE – Celanese Corp – Chanel – Charter Communications – Chubb – Coca-Cola – CPS Energy – Daiwa Capital Markets – Dana Foundation – DaVita – Daybreak Game Co. – Delta Dental – Disney – Dish Network – Dole Food – Duke University – Eaton Vance – Encore Capital Group – Ensco – ExxonMobil – EY – Federal-Mogul – Flagstar Bank – First Bank – Fox Studios – General Electric – General Motors – H. B. Fuller Company – Herman Miller – Hess Corp – Intuit – Kiewit Corporation – Kingston Technology – Komastu – Konica Minolta Business Solutions – Korn Ferry – Legrand – Loblaw Companies – Lockheed Martin – Maritz Holdings Inc. – McCarthy Holdings, Inc. – MGM Resorts International – Mohawk Industries – MSC Industrial Direct – MTA – M&T Bank – Murphy Oil Corporation – Mutual Bank – NASA Ames Research Center – NYU Medical Center – NBC/Universal/Comcast – NCR – Ogilvy & Mather – Optum – Orlando Utilities Commission – Oxford Industries – Parker Hannifin – Paychex – Philadelphia Gas Works – Physicians Mutual Insurance Company – PPG Industries – Qorvo – Raytheon – Ryder – Ryobi – Schindler Elevator Corp. – Sears – Shaw Industries – Siemens Corp. – Steelcase Inc. – Spectrum Brands – Sysco – TD Ameritrade – Thomson Reuters – Time Warner – TMZ – Torchmark – T-Mobile – UMass Memorial Health Care – USC – U.S. Dept. of Labor – UPS – Veolia – Verizon – Wegmans Food Markets – Western & Southern Financial Group – Williams-Sonoma – World Vision International – Yale University…and many more. IT Brand Pulse is a trusted source of research, data and analysis about private, public and hybrid cloud IT infrastructure, including servers, storage, networking and operating platforms. Learn more at itbrandpulse.com.